Leonidas Witherall is a secret writer of mystery novels and an amateur detective. He looks like Shakespeare, and his friends think that he is incredibly clever. In this novel, he is returning from a trip around the world, and is on the last leg of his journey on a train which will take him home to Dalton. On this train, he saw a mousey, grey woman hide a package in the bottom of a trash container. Unable to control his curiosity, he took the package out and found that it contained a gun and a pair of handcuffs. He rewrapped the package and put it back. This action will get him involved in a strange series of events on the train which will conclude with him getting banged on the head. Meanwhile, while he was gone, Leonidas had entrusted his friends with the job of getting a new house built for him. He had given them the necessary money and the plans. He was indeed a very trusting man. On the train, he met a young man named Dow who befriends him and agrees to take him to the new house in Dalton. After a very confusing drive around Dalton, they at last arrived at the new house which is not quite what Leonidas had in mind when he gave his friends the plans. Leonidas was quite thrilled with the house which is described in a remarkable amount of detail. At the end of his tour of the house, he finds the body of a woman in his car in the garage. He finds out from Dow and Cassie, an older friend of his, that the body is that of Medora Winthrop, an incredibly wealthy and very difficult woman who was his neighbor. In the best tradition of cozy mystery novels, Leonidas, Dow, and Cassie decide that they will find out who the killer is. Their investigation is complicated by the invasion into his house of many citizens of Dalton who wish to look at the architectural and decorating wonders of his new house. It is, of course, necessary, to keep them from looking in the garage where the body is still in the car, and this body will remain undisturbed in the car for the rest of the novel. So much for any crime scene forensics. The investigation proceeds in a rather haphazard way and eventually the solution is found. I hope that this novel is meant to be a farce. Some parts are down right silly, some parts are funny. The actual solution of the crime is stuck on at the end after a great deal of running around by the amateur detectives. If you are looking for humor and farce in a mystery novel, this is a book for you. 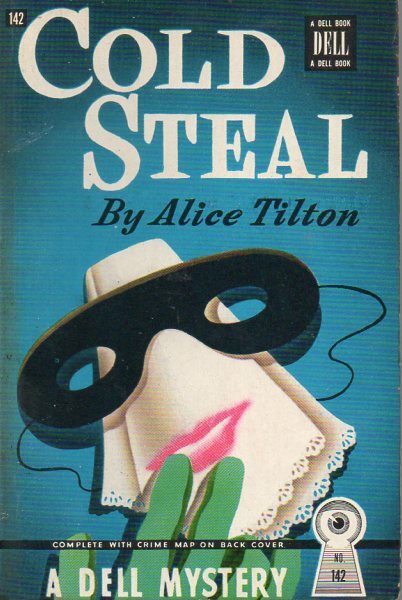 Alice Tilton is one of the pen names of Phoebe Atwood Taylor who is the author of the more conventional, but cozy Asey Mayo mysteries which are set on Cape Cod. This book was published in 1939. 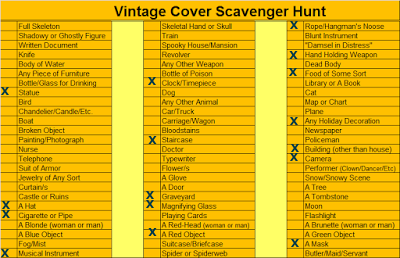 I have read this book for the 2017 Golden Mystery Cover Scavenger Hunt in the category of a book with a mask on the cover.